Fundraising is a challenge under the new tax laws, but with the right tools, used to their full capabilities, they can help nurture existing donors and expand the reach of the organization to bring in new donors. Digital donor walls can be the perfect tool in these challenging charitable times. The new tax laws have dramatically changed the charitable giving arena. Charitable giving becomes more about doing something for an organization than about a tax write-off. Fundraisers and developers must work harder than ever to bring in new donors but also nurture all the previous donors. The most critical challenge is building personal relationships with donors so they feel the connection with the organization and want to give. Donor Stories – spotlight prominent donors, or special individuals with a digital page dedicated to them. Share their giving story with text and photos or personal videos. On the Spot Giving – Don’t let visitors get away. Give them a QR code or option to donate right at the digital donor wall. Share Content Beyond the Donor Wall – Keep donors informed with real-time information of upcoming events, donation options and even livestream video for donors who can’t get to events, such as live auctions. Share your digital donor wall with everyone with a shareable URL that is viewable on any device. Organization History – Establish an honorable giving platform by adding history and timelines to your digital donor wall. Easier to update than static history walls. Promote Events – Keep donors engaged with current announcements of events, awards, scholarships and new giving opportunities. With any fundraising organization, every donation needs to be used wisely. Sometimes it is hard to understand the necessity of donor recognition. It can seem like a waste of money and because of this, many donor wall displays develop into cheap afterthoughts that don’t encourage other donations or celebrate the donors. They are looked at as an ending to a campaign, but there is a smarter way to look at donor walls. Donor walls should be looked at as an effective marketing tool. Great donor walls visually connect visitors with the mission and vision of the organization, the particular campaign or reason for the donations and most importantly nurture the donors by presenting their names in a celebratory way. All donor walls should provoke emotions in the visitors to turn them into donors. The use of digital easily enhances the marketing perspective of donor recognition. It immediately grabs the attention of visitors and readily gives them realtime information not shown on most static donor walls. It keeps information directly in front of potential donors all the time. 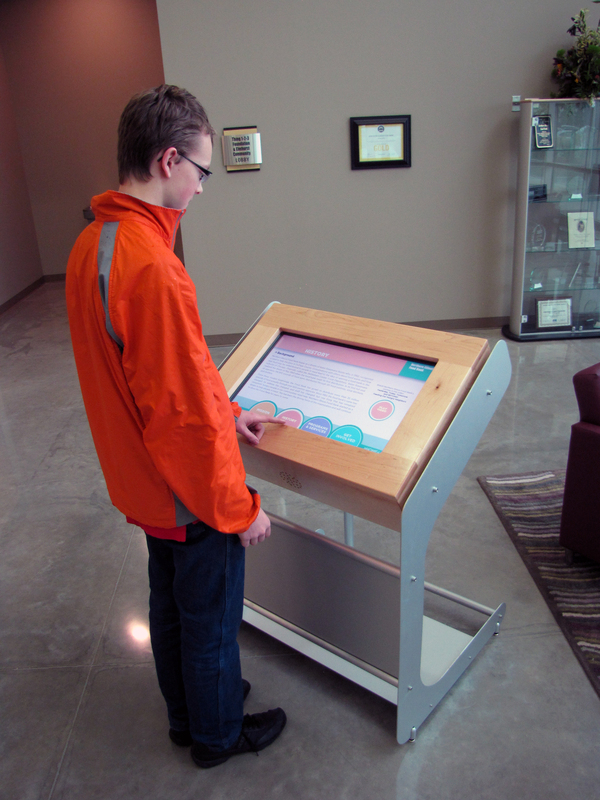 Digital donor walls are easy to integrate into different combinations of donor recognition. Many organizations combine static donor walls with digital. 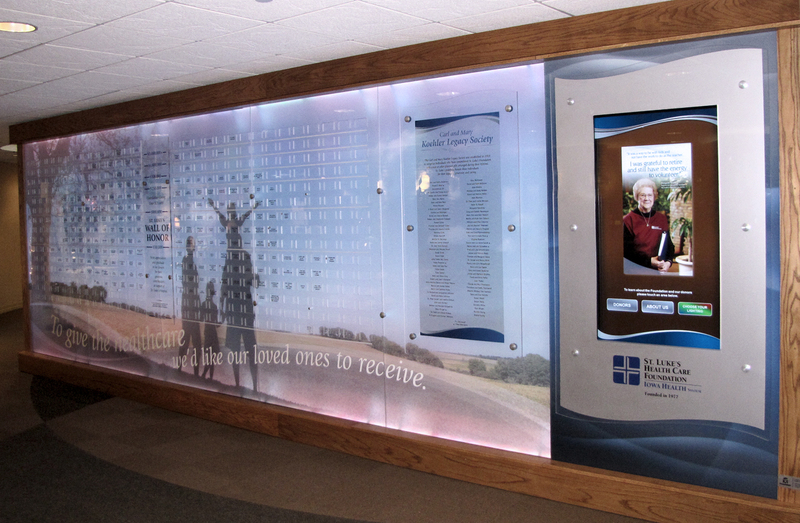 Older donor displays can be replaced and combined into one glorious new digital donor wall. Highlighting the larger donors on the static wall and listing smaller donors on the digital. Digital donor walls can individualize content. Easily adding video, social media links, RSS feeds, donor stories, organization history, calendar of events and board member information that can shared online through a personal URL. Older donors and distant donors are kept up to date with the organizations fundraising efforts and needs without expensive mailers. Realtime and relevant information is continually available to donors. 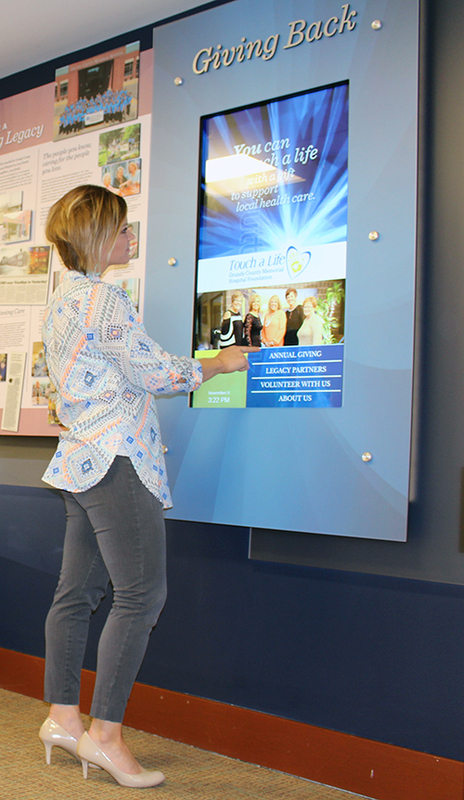 Digital donor displays and kiosks are the most costly option of donor recognition but when looking at the goals of fundraising, digital donor walls give a better return on investment (ROI) than other donor wall option. Stock donor walls are very costly in the overall cost analysis. They do a poor job of nurturing donors or building donor relations, in fact they probably hurt relationships because they are unimpressive to donors. Stock donor walls have a limited outreach to encourage more donations. Digital donor walls give the tools to reach more donors, more often with more information at less cost than any other marketing tool. They reduce or eliminate the need for other costly marketing efforts, such as mailers, which take money and time to complete. They reduce the cost of updates and the updates can happen quickly and more timely than static walls. It is harder than ever to get donors and keep them. Appealing to a donors senses is an easy way to reach out. A donor wall that visually tells the organization’s mission and vision and makes them stand out is more important than ever. Showing how an organization is different and important will give donors a reason to support one organization over another. Fundraisers have to use every tool in the kit to keep money coming in and use the funds wisely. Digital donor walls are a smart use of money over stock donor walls. The world of digital signage has become difficult to navigate. What is needed to develop and maintain a digital donor wall? First, What are the need and wants of the digital donor wall? Second, What are the physical needs? Third, What does the system need to do easily or have included in the software? Why Arreya Digital Signage Suite? Arreya Digital Signage Suite was developed for digital donor walls. Frustrated with the products on the market, Presentations, Inc., the parent company of Arreya, decided to develop their own platform. Over 20 years of experience in the donor wall and museum industry along with knowing what was wrong with all the other platforms, made it easy to know what foundation, fundraisers and development directors wanted and needed in their digital signage platforms. Arreya™, as the name implies, provides an array of visual communication opportunities to wi-fi-enabled digital devices simply and instantly. Arreya is the only cloud-based digital signage system of it’s kind. Before Arreya, creating, editing and managing content on a variety of devices had been tedious and expensive. It encompasses all of the 30 system needs listed previously, and then some. Under the Presentations umbrella, is a complete package of in-house services to envision, design, develop, fabricate and install digital donor walls. Unlike other donor wall providers, Presentations is a one-stop shop, there is no third party vendors involved anytime in a clients project, including after. The team of engineers, artists, fabricators and developers assure every project exceeds expectations and is not a source of stress for the client. As a Google Cloud Partner, Arreya brings to the table the most powerful and reliable hardware on the market. The Arreya development team works closely with Google to test new Chrome devices and expand the abilities of Chrome devices. The Arreya Digital Signage Suite team is accessible at the beginning of the project and in the future if there is ever a problem or question. No third party providers to contact with technical issues. All technical issues and questions are answered by the Arreya development team. Many frustrated clients have contracted Arreya to successfully retrofit current digital donor walls with the Arreya and Google Chrome platform.